So my printer is built and corexy (x and y axis) works wonderfully. Wish I could say the same about the Z-axis (I use 4 smooth rods and two 8mm threaded rods connected to two motors via flexible couplers). It seems that many corexy printers lack good Z-axis (for example many use cantilevered beds). So what would be the best configuration? *Two leadscrews connected to a single motor by a belt? *What about linear guides/smooth rods? Are not 4 of them overconstraining a plane? Maybe use 3 of them? 2 seems like a big no-no in my book as it makes a bed cantilevered. *Sli3der seems to perform great: [richrap.blogspot.dk] Maybe use a spectra line? For some reason I feel uncertain about it and belt seems like a more robust solution. Edited 1 time(s). Last edit at 11/16/2015 04:56PM by Edvardas. I think three leadscrews driven by a belt is a good idea, but I could probably live with two on opposite ends of the bed, not cantilevered. There are no forces working to tip the bed when supported by two screws, so it should be OK. Three provides even better stability. Four is going to cause problems. Don't use threaded rods for linear motion unless you're making something in which the sloppiness they produce is OK. Usually it is not OK. I like linear guides. They are as good or better than bearings have to be for 3D printing. I was looking forward to hearing your reply as I am impressed by your 3d printer, sir. Have you got an idea on the couplings that should be used? I am now using flexible couplings that allow axial movement of the threaded rods so Z0 is not set rigidly and shifts after removing prints off the printbed. I think that a ziptied PVC hose used on my prusa i3 threaded rods actually work better. I am still unsure if leadscrews are the best solutions. It seems that many are fighting Z banding and I do not want to spend 100 euros on the leadscrews that are not going to give an optimal performance. Using belts to directly drive Z axis seems like a best performing solutions but I am lost in step size/microspetting/holding torque and so on. 0.2mm layer heights are actually fine by me so resolution should not be problem. The bed size make a very big impact in the solution to use and this is something your are not considering. My corexy was an little bed of 20cm x 20cm. I´m using a very simple solution of one 8mm leadscrew and two 12mm rods with two 12mm bearings for each rod. For you is a big NO NO and i do not agree. I have this solution implemented and it simply work. The bed is always very precise and move fast with an constant speed. For bigger beds like 40x40 you can add an 3º rod in the opposite side or simply an second motor with an 8mm leadscrew. You are trying to solve your problem adding more rods, motors or changing the linear motion system, this is one way to solve this but i think there are simply and cheaper ways to do the same. -You are using 8mm rods, i think you need to go 12m minimum. - change the flexible coupler to rigid coupler. I have used flexible one before and for me it was problematic. I was changed to an rigid coupler and it give me better result, less vibration and better/constant movement. - And the most important suggestion is to not use only one bearing in each rods, this will not give enough horizontal support. The bearings of each rods must have a good distance between them. For me i only consider adding an second motor in case the first motor do not have enough force to push the bed up. Adding an second motor or an second leadscrew can be problematic if they not move the bed in perfect synchronization. Here is a current printer design: [www.thingiverse.com] Bed is at around 20x30cm. Each of the four 8mm rods have two lm8uu bearings on it. I do not like the printed bearing's housings as they seem to squish the bearings and make them stick on the rods if I slightly overtighten them. Based on your ideas I think I could use a single leadscrew and two linear guides. Linear guides have no play so cantilevered bed should not be a problem. Then it would be a matter of rigidly fitting a bed's 2020 profile to the linear guide's train. It seems that the best solution should have enough contact points to make design rigid but not too many contact points as that would overconstrain the plane and bring its own problem. When people switch from threaded rods to lead screws, if they are still having Z banding problems, it isn't because of the screws. It's more likely that the coupler isn't centering the lead screw over the motor shaft combined with using flexible, end-supported guide rails and maybe a flexible printer frame. The motor end of the screw (at least) should have it's own bearing. That keeps it centered and makes the alignment with the motor shaft less critical. You should be able to print a motor mount that has a bearing for the lead screw and room to add a shaft coupler for the motor. Z axis motors generally run pretty cool so a printed mount should hold up just fine. You already have build an z axis, but is not working great... I think before trying to rebuild the Z axis from scratch you can try to fix it first. You are using 4 rods and 2 threaded rods, in theory it should be an very solid solution. Why is not working great? Can you tell in more details the problems you having? Thats 75 euros for one set and at 150 euros for 2 it would better be worth it It is also possible to buy a leadscrew without machined ends for cheap and when print bottom fixtures but I am looking for high repeatibility so using decent components seems worth it. Unfortunatelly I can not find many second hand leadscrews as that seems practice suggested by you. Frame is rigid enough as you can see from the design and I used the metal corner brackets to connect 2020 profiles instead of printed ones. I chose this printer design just because of the z-axis design that seemed robust. 1. M8x1.00 mm threaded rods have a lot of backlash (much more than on my prusa which uses m5 rods(pitch of 0.5mm I guess). And I use a z-lift of atleast 0.2mm so this makes my worry. 2. While lovering the bed the nuts on the threaded rods are "screaming". I tried to oil them but no help. Check next problem for a solution to this. 3. Flexible couplers move axially which messes up the z0 settings. I have just mounted some silicone tubing instead but it seems to be slightly slipping on the motor shaft. However silicone tubing got rid of the mentioned "screaming". 4. As mentioned in earlier post the housings of the linear bearings have to be tightened on the loose side or the bearings gets squished. The z-axis is not horrible and probably not any worse than many chinesse reprap printers but I want to have a design with great repeatibility. Thing is I was really excited about this design at first and started buying materials (like 2020 extrusions). Then started reading and realised that Z-axis which I thought to be great might not be as great if I use threaded rods and non supported round shafts. So I thought about upgrading it later and bought cheap stainless steel 8mm shafts and cheap lm8uu just to get a printer going. Now it is printing and I want to upgrade the bed before I start working on multi nozzle extruder. So I was researching on the motor stepping/microstepping and it seems that I could base my design on this one [www.thingiverse.com] If I use GT2 20T pulley and a 200 steps per revolution stepper. I would come up with a Z axis resolution of 0.2mm per one full step which is what I use most of the time (anyone care to check if my step/resolution math is right?). Later I could get a 400 steps per revolution stepper if I would need 0.1mm resolution per full step. I could design the brackets and see how I like it with the rest of the 8mm smooth rods. If it works good then I could upgrade rods to fully supported rods or linear guides. Edited 1 time(s). Last edit at 11/17/2015 11:26AM by Edvardas. As a rule of thumb, if you don't want to spend time iterating the design and fine-tunning, you will have more luck building simple and strong structures, then complicated advanced structures. There are absolutely no problems in a cantilevered design (!) - Not many years ago most mills (for metal working) was with a cantilevered bed. 1) Reduces your Z height - The distance between upper and lower bearing is hard to keep as Z height (but might have been lost anyways, depending on design). 2) Parts that flex will have a very long arm. As in, if you have a flexing in the linear rod it will twist the bed in the horizontal plane and the effect will be big at the edge of the bed. The advantage is that the load case is very simple and easy to understand. Your math is OK but it doesn't work like that. To get consistent print with 0.2mm step you need to have a higher resolution then just 0.2. I don't remember the multiplier (but 16 or 32 microstepping will be fine) . On the proposed design you will most likely have problems driving the motor if you don't get at least the DRV8825 (1.5A instead of 1A). The DRV8825 will also give you more microstepping (32 against 16). If you do change the design to the [www.thingiverse.com] please be sure to report back and tell of your experiences as it is a design that gets mentioned often in these forums. Very interested how it holds up but I don't have any obvious ways to test it my self. You can also look at this threadd where we recently discussed bed designs (among others) - FatFreddie, another user of the mentioned design, also uses a geared stepper - But it looks like the initial creator uses a normal stepper. I have read that at full steps motor has a higher holding torque (which is important in this instance). If a motor works on lets say 16 microstepps does it still have a full step every 16 micro steps where it has that higher holding torque? Or does it work on microsteps only? I can already see that green A4988 seems weaker than black version I have used before. Next, when we talk about reduced torque for microstepping, we talk about that particular microstep. When you have microstepping you have that "any load torque will result in a “magnetic backlash”, displacing the rotor from the intended position until sufficient torque is generated." That means, if you are dividing your steps into 32 microsteps and you want to stop the printer at 17/32 of a step, then the torque available to hold it at that particular fraction of a step is roughly 5% of the rated torque but the further away you drive your shaft from the intended 17/32 the more holding torque it generates. This is true until you actually reach the full step and the full holding torque. The stepper missing a full step is a different thing and permanent event that the stepper does not recover from if you removed the load (does not return but finds 17/32 one step back instead). I learned that and took the quote from reading : [www.micromo.com] . - The motor will have the total weight of the bed. - There are to many teeth of the motor pulley that are not in contact with the belt. 1) You can use an lead screw to solve the noise problems. I using an 8mm lead screw (2mm pitch) and it print at 0.1mm resolution perfectly. 3) use bearing that already have aluminum casing, it will be less flexible e more easy to install. Instead of using 2 bearings for each rodds you can install an long one, their are twice the length of the normal. Edited 2 time(s). Last edit at 11/17/2015 01:00PM by filipeCampos. In an industrial machine with a large cross section cast iron frame you're right, there are no issues with cantilevering for most work. In hobbyist 3D printers cantilevering is usually implemented with thin, flexible end-supported guide rails supporting the cantilevered bed and undercarriage, or worse, in non core XY designs, they cantilever both the X axis/extruder and the Y axis with moving bed (see "SmartRap"), using guide rails as structural components. It's a recipe for disaster. The most amazing thing about such designs is that they manage to get them to print at all. Have a look at Filipe's cantilevered bed in his printer design (see link in his post above). It is neither thin nor flexible, being made of 2020 & 2060 extrusion with plenty of braces and ties to hold it together. I've just built one, and it's solid. I do not have a Z-max. I use an endstop at Z0 (zero coordinate) so only Z-min is present. Before every print I simply home all the axis. Any earlier missed steps does not mater. I am now thinking that under the current setup there is no way to make sure that a motor stops at full step then bed travels to Z0 coordinate. This means that before powering the printer bed rests at the bottom of the printer. Then I home axis bed travels up and if a distance to Z0 is for example 200.3 mm the bed will stop at 16th or 17th microstep (if 32 microsteps stepping is considered) and will work on this microstep throughout the whole print. If distance is 200.2mm then the motor would work at full step for the rest of the print. Edited 1 time(s). Last edit at 11/17/2015 05:12PM by Edvardas. Ok, for the first part - Using Z min - That is an alternative setup. Do you then adjust the bed level manually by adjusting the bed height on the printer itself? I guess that should work. Second part - As a consequence of what I wrote in previous post, it is desirable to have more microsteps the forces sums up and you get at least the same performance as less steps. It is important to understand that using full steps does not mean that the stepper stops at exact [200.2000] it stops at [200.2 +-(tolerance) +-(load induced variation)] - The holding torque is the torque the stepper provides before missing a full step - It is in no way the equivalent to a mechanical lock-pin. [note] - Some firmwares and 8 bit electronics can (supposedly) have a hard time providing signals fast enough for high step rates but I believe this has been solved in all the big firmwares out there (not my strong suit). I have printed quite a lot on a solidoodle gen 1 and the cantilevered bed is often a problem, albeit being a small bed, not because it can't take the weight but because the vibrations at fast infills multiplies depending on the size of the printed part and can get to crazy resonances. I often thought that the same 2 smooth rods can be placed at opposite sides of the cantilevered bed and it will be much better. Of course 3 would be even better and all screws driven by a single motor/belt, but if no budget for that even moving a single rod on the other side can make a difference. Both SmartRap CoreXY and Slid3R use belt/spectra for Z and yes, current interruption means bang but otherwise the solution works ok for 99% of the cases. The belt design you have mentioned several times in the thread, as LarsK already mentioned, is very often mentioned and I would also be very interested about more reports on it. The weak contact of the pulley with the belt is something that should have been better designed but maybe if the bed is heavy enough the weight will pull the belt making it want to pass through the pulley so a firm contact at least is there. Edited 1 time(s). Last edit at 11/18/2015 10:51AM by realthor. I realy like the design of AndreasL. you expect it unstable but the Z plate squares and hold all together. It's cheap, it works pretty well and it's fast. I love the belt holders : quick, easy and efficient. After a lot of cycles, no belts moved out. That's what our fablab install on our SmartRapCore printers. One is 300x200mm. we have a end code that low the bed at the end of the print, there's no issue, to motor holds heavy prints properly with no issue. What is important to me, is the print quality, and it's surprizingly good. To me, the design of AndreasL is just a start. I printed one for dev purpose, and there's several things that can be improved. First, some parts are too thin. Especialy supports and the ends of the arms. The supports have only two screws, and that's not enough. You need at last 3 in triangle. The worst point IMHO is resolution, you only get 0.2mm at full step. That's why I want to install a belt reduction 4:1. With a belt reduction the Z resolution will be under 0.05m. And, there will be no issue with bed weight and it will hold upscaled build volumes. I want to use better pulley and idler pulleys too,608zz is a standard, but smaller diameters are better and belt teeth rund better on proper pulleys. There's no glory wto use expensive and complicated stuff like ball screw, rock solid guides and structure, and cosly machinist measuting tools to make all work properly. On my CNC, the Z ensemble itself weight 35kg (77lbs) cost me more than $2000 and believe me that baby is tuned within 0.02 mm (0.001") ! What realy impress me are simple and unexpensive things that works fine with a belt few bearings and just a speed square for setup. So what's the best Z-axis configuration to me ? Only speaking of the mechanism to move the bed and not the bed structure or linear motion. AndreasL is an interesting concept but i still think the use of lead screw is better. One lead screw of 40cm has cost me 18€ on ebay and more 2€ for the coupler. If you go to the AndreasL solution it will be really cheaper? You still need to buy the belt, pulley and bearings. The total can be less of 20€.. but it really worth it? You still need to solve to problem of the missing reduction, something you automatically have in an lead screw solution. The belt allow fast speed, but you need this type of speed in the z axis? Edited 2 time(s). Last edit at 11/19/2015 06:25AM by filipeCampos. You would need 2 screws for the same intent. The original smartrap has a different size (larger) upper pulley that acts as a reduction as I read somewhere. Can't that solution be applied for AndreasL's solution as well? @J-Max: you don't want to use micro-stepping? Even a modest 4x or 8x would get you to the desired resolution. I aggree that leadscrew offers best resolution per dollar so to speak but as I tried to explain and get an answer in another thread, I don't think it is necessary. The high resolution of a leadscrew is more a happy accident than an intention in the design of 3D printers. Edited 1 time(s). Last edit at 11/19/2015 06:56AM by realthor. I think that 4:1 reduction via pulleys would be complicated to achieve. Better do 2:1 belt reduction (40T and 20T pulleys) and use 400 steps per revolution stepper motor. That would be more compact and easier to source parts. - Idler size makes no difference to gearing. Can be big or small. If using plain bearings with the belt tooth running against the smooth surfaces then it can be an advantage to user a big idler because of vibrations. I am not sure that this is actually true to a point where it matters - but on the paper it is correct. Moreover - I am generally positive to belts. You do not have all the alignment problems that you have with screws. For me the price is not the kicker. I really just find it simpler and neater, but I need to go back and have another go at screws to really back that up with some true experience . It is in no way a definitive "always" belts for me. 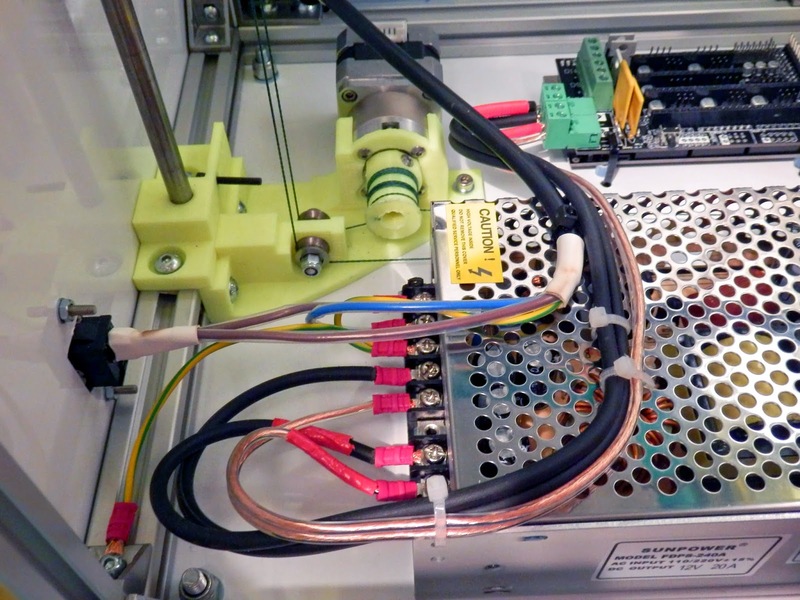 In your Fablab SmartRapCores - Do you use geared stepper or high current drivers or how do you drive it? If a belt would be used on a cantilevered bed then it is a very simple design with few parts like on an original smartrapcore. I think that belt on a Z-axis would be more forgiving to any design flaws. Screws need to be mounted just right or they cause trouble. Now if I want to use two screws I would need leadscrews with machined ends in order to fit them between bearings at both ends. I would still need pulleys and just right lenght close ended belt to run these screws of a single motor. Thats is quite a complicated mechanism. TR16x4 mechined-end leadscrew with a nut costs 30 euros for a set off dold-mechatronics. Here is some information on the correct mounting techniques for leadscrews [blog.helixlinear.com] You can mount a single leadscrew according to A technique but to be able to use two screws driven off a single motor one would need use technique B. For this one would need a high quality perfectly straight lead screw otherwise screw would transmit any irreguliarities to the bed and to the print itself. The idler makes absolutely no difference to this math. It is the motor and only the motor that controls how many mm the belts move. If you make a gearing like I showed here, then you achieve that you need to move the belt 2 mm to move the bed 1 mm. It is not a gearing of the belt. It is an introduction of ratio between bed movement and belt movement. Edited 1 time(s). Last edit at 11/19/2015 08:09AM by LarsK. Excellent page. Been looking for something like that. Thank you. What microstepping is used on Z-axis? What is the problem with current 0.2mm per step setup? Is Z0 easy to set and repeatable? I could redesign AndreasL design on solidworks to be used for 2020 profiles and make it all beefier. I would also use 624 bearings for idlers as its size is almost the same as 20T GT2 pulley. Or do you know an European supplier of GT2 idler pulleys? Actually on AndreasL design only one idler pulley would be needed as the rest of idlers run on non-toothed side of belt. Edited 1 time(s). Last edit at 11/19/2015 08:29AM by Edvardas.